On Sunday, June 12, 2016, the ARS of Western USA will hold a fashion show, whose proceeds will benefit the ARS “Soseh” Kindergarten Rebuilding Project in Stepanakert, Artsakh. The show will feature the designs of Lilit Margaryan’sGallery 100 design collection. The pieces are inspired by the works of 20th century Armenian painters. The ARS “Soseh” Kindergarten in Stepanakert, Artsakh was established to serve as a safe haven for children of the soldiers of the Artsakh War. The kindergarten is essential in contributing to early childhood development and education in a nurturing environment. The rebuilding project aims to construct a new 2-story structure and playground that will grow to hold between 100-130 children of Artsakh, who will benefit from the state of the art educational facility. The fashion show will be held at the Universal Hilton, 555 Universal Hollywood Dr., Universal City, CA 91608. Guests will enjoy a cocktail hour between 5 – 6 p.m., theater style fashion show from 6 -7 p.m., followed by a formal dinner at 7:30 p.m. Tickets are $125 per person and can be purchased by contacting the ARS Regional Headquarters at (818) 500-1343. The ARS Javakhk Fund will hold its Annual Dinner Gala Reception aboard the yacht “Eternity” on May 15, 2016. Tickets are $150 and can be purchased by calling the ARS Regional Headquarters. Proceeds will benefit the ARS youth centers in Javakhk. The yacht will depart from 3439 Via Oporto, Newport Beach, CA 92663. The ARS Javakhk Fund has been actively organizing community forums on “Javakhk: Past & Present.” To date, forums were held in Glendale on March 31, 2016 and in Las Vegas on April 17, 2016. A lecture and visual presentation was given by John Kossakian on the history, demographics, and present day situation of Javakhk during both events. The Armenian Relief Society continues its fundraising initiative to lend assistance to Artsakh. Visit http://ars1910.org/artsakh/ to make an online donation or mail checks payable to the Armenian Relief Society to the ARS Regional Headquarters at 517 West Glenoaks Blvd., Glendale, CA 91202. The ARS of Western USA, in close collaboration with Dr. & Mrs. Vartkes and Mary Najarian and family, shipped a container of medical equipment and supplies to Armenia/Artsakh on May 9, 2016. The Najarian family was instrumental in the realization of this effort, which also had the volunteer support of Pilibos Armenian School students and the Armenian Youth Federation. The ARS extends its sincere thanks for its community’s support. On behalf of the City of Los Angeles, Councilmember Paul Krekorian recognized the Armenian Relief Society of Western USA, at the Armenian Genocide Commemoration event on April 20, 2016 at Los Angeles City Hall, for exemplary work and service in the Armenian community. ARS Regional Executive Board members Aida Babayan, Annie Bostanian, and Carmen Libaridian were in attendance and received the recognition plaque. In April 2016, ARS chapters and members throughout the region participated in their local community commemoration events on the occasion of the 101st Anniversary of the Armenian Genocide. Participation to various events included the Rally for Justice in front of the Turkish Consulate in Los Angeles, and commemoration events at the City of Glendale and Armenian Genocide Martyrs Monument in Montebello. ARS one day school students also commemorated through various means, such as the Glendale Sepan Chapter Saturday School students, who placed flowers at the cross stone at St Mary’s Armenian Apostolic Church on April 23, 2016. On April 3, 2016, the ARS School Board of Regents held a breakfast fundraiser at the ARS Regional Headquarters to raise funds for its educational programs and activities. A Night of Recognition was held on April 10, 2016, serving as an opportune time for the ARS Regional Executive to commend members and ARS one-day school teachers, alongside two of its vital programs: ARS Social Services and the Child, Youth, and Family Guidance Center, following the declaration of 2016 being declared as the Year of Service by His Holiness Catholicos Aram I. During the event, Glendale City Mayor Paula Devine gave special recognition to Jasik Jarahian, ARS Regional Headquarters General Manager, for her 25 years of dedication to Armenian communities both locally and internationally and in helping advance the mission of the ARS. ARS Sepan Chapter member Christine Hovnanian was recognized as one of the Women of Excellence Award recipients at the Armenian American Chamber of Commerce Annual Gala on March 11, 2016 at the Glendale Civic Auditorium. The ARS Glendale Sepan Chapter invited Syrian-Armenian fashion designer Kevork Shadoyan from Armenia to feature his designs during the chapter’s fashion show on April 30, 2016 at the Glendale Hilton Hotel. Near 400 guests were in attendance to view Shadoyan’s collection whose pieces are inspired by traditional Armenian costumes. Rosemary Minasian of the ARS Fresno Mayr Chapter was honored as the Holy Trinity Armenian Apostolic Church’s Mother of the Year on May 8, 2016 at a banquet organized by the Church’s Youth Group. She received a plaque for recognition. Over 100 students representing 7 ARS one-day schools joined together at the ARS Regional Headquarters on April 9, 2016 for the Annual ARS Quiz-Bowl organized by the ARS School Board of Regents. Sona Madarian, Chairperson of the ARS School Board Regents, facilitated the quiz-bowl, during which students answered questions related to Armenian history and culture. On May 1, 2016, the ARS Fresno Sophia Chapter celebrated Mother’s Day at Fort Washington Country Club by honoring members Rosie Bedrosian, Vicky Kataroyan, and Rita Shamlian as Mothers of the Year. Rozine Derderian Bedoyan, Diana Mosesian, and Shogakat Papoyan were honored as Most Dedicated Members of the Year. The ARS Orange County Sevan Chapter held a Garden Tea Party on Saturday, April 16 at Wilcox Manor. Mary Sarkissian, Sevan Chapter member, generously sponsored the event. 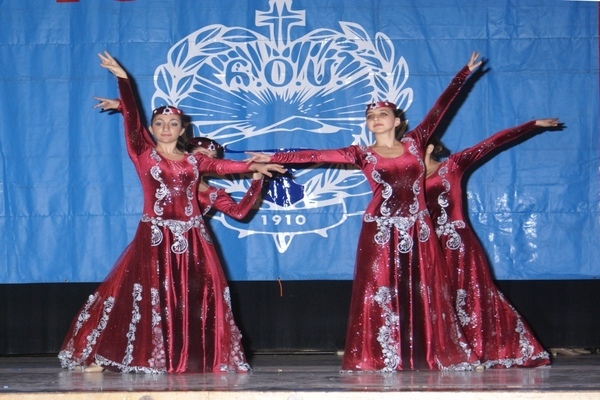 On Friday, March 18, 2016 the ARS Oakland Erepouni Chapter’s Friday Armenian School held its annual end of year program. Students recited poems, sang, and displayed their athletic skills for ARS members, parents, and friends in attendance.